Have you put away all of your Christmas Holiday decorations yet? I have to admit, I still have a few of my favorite crafts still up as I transition to the next holiday, Valentine’s Day. I came across a box of glittery red ball ornaments that I never got a chance to craft with in December, and I knew I had to turn them into a super easy and cute Valentine’s decor craft idea. I decorating for the day that celebrates LOVE. And who doesn’t love hearts, red and pink things? Add a little glitter and I’m sold! I took the challenge again to participate in a Craft Lightning craft idea – one that can be done in less than 15 minutes (minus the drying time). The supplies I used were plastic red glittery Holiday ball ornaments, Tulip Glow in the Dark Puffy Paint, Elmers Krazy Glue, and clear candlestick holders that I found at the Dollar Tree store. You are not going to believe how easy this craft is. First attach the ball ornament UPSIDE DOWN on top of each candle holder and let set. I used Krazy Glue because I knew it was clear and would set up quickly. Then add 3D puffy paint hearts on the ball. It’s simple to make a cute heart. Simply use the applicator tip to draw a “V” shape starting from the top and meeting at the bottom of your “V”. I put puffy paint hearts all around the middle of each ball and one at the top. Let your heart design dry and finish off your craft with a pretty ribbon or twine bow. And the best part is, when the lights go out, the hearts will GLOW! 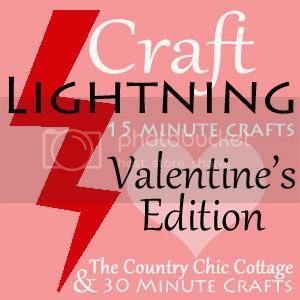 Be sure to check out more Craft Lightning ideas for Valentine’s Day! Such a smart re-use! Thanks for participating!! I LOVE that these glow in the dark! How fun is that? ?